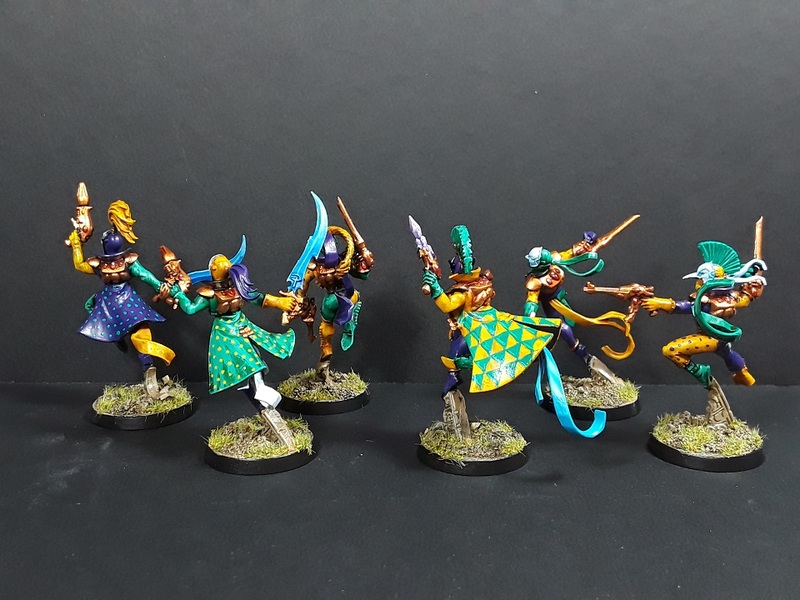 Mordian 7th Regiment: 40k Harlequins - Troupe complete! 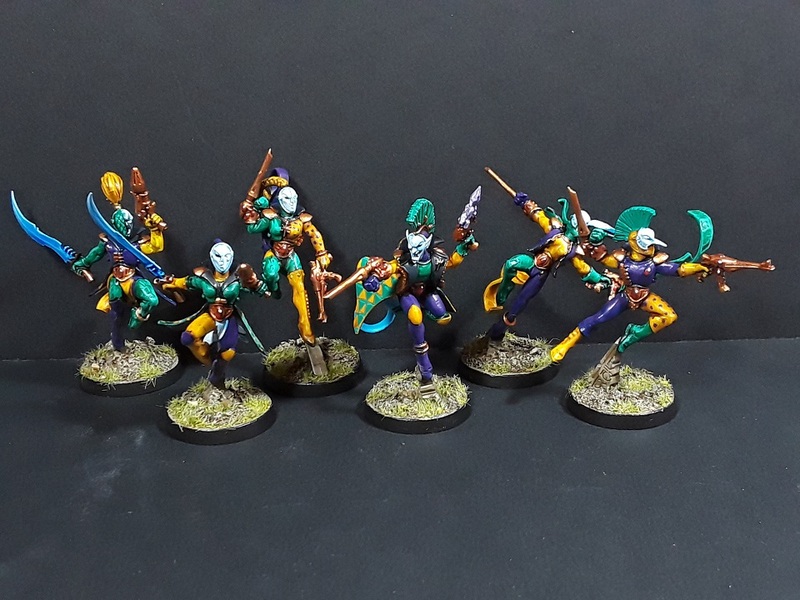 Continuing on with the "pulling random old stuff off the shelf" plan I've been working with, There's been a small troupe of Harlequins quietly gathering dust for well over a year. But no longer! 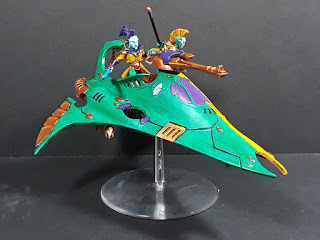 Originally intended to be part of a Dark Eldar army I started and eventually shelved ages ago, these clowns got the Mardi Gras scheme of purple, yellow and green - always an eye-catching combo! Freehanding a zillion little triangles and polka dots was an exhausting exercise! 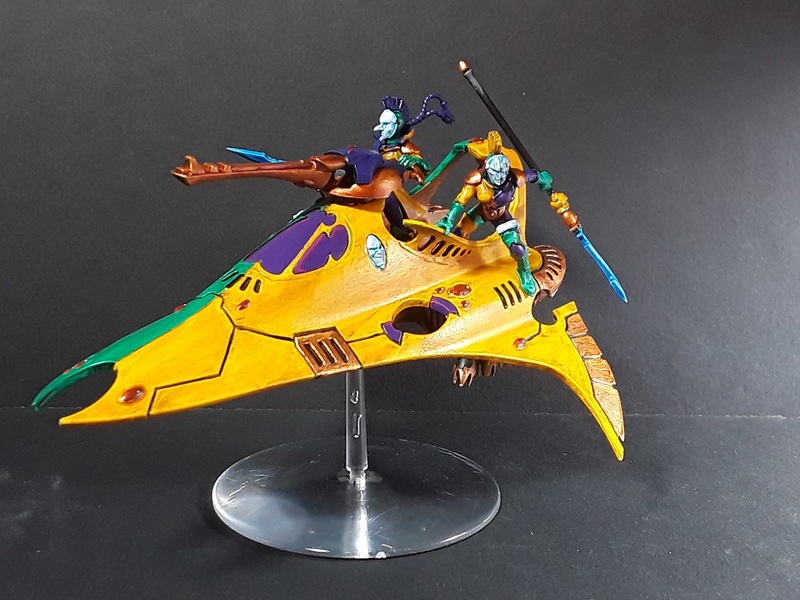 The troupe's Skyweaver got the same scheme to tie them together, and I am considering adding some further triangles or polka dots along the front of the fuselage - I think it could stand a little more flair! Overall however I'm fairly happy with 'em, definitely was fun to break out some eye-twisting colors! Hah! 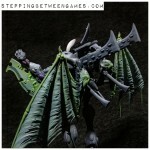 I'm there with ya - There are more Harlequins on the shelves, and there they'll remain! I appreciate it! Aye, I did go a liiiiiiittle mad... Wibble. You free handed all of those triangles on that cloak?!?! You're a better man than me! Much better..
Lightly sketched in in pencil, then slightly cross-eyed painting! Heh. They are super ! Mardi Gras scheme, you say ? very pretty. Cheers! Provides some good contrast! Look good mate. If their flashing weapons don't kill the enemy, their garish colours will at least blind them momentarily, ruining their aim.